here ! 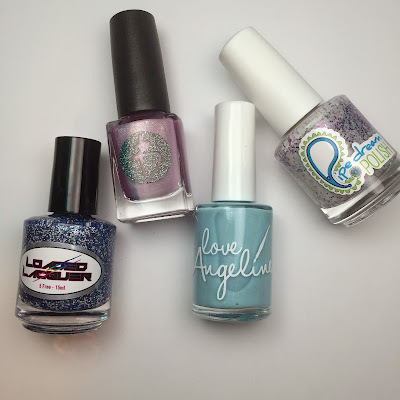 It has been really fun in the past few months getting more interested in and experience with indie polish brands! You really have the opportunity to get to know the makers, and they share your passion because they are polish lovers too. 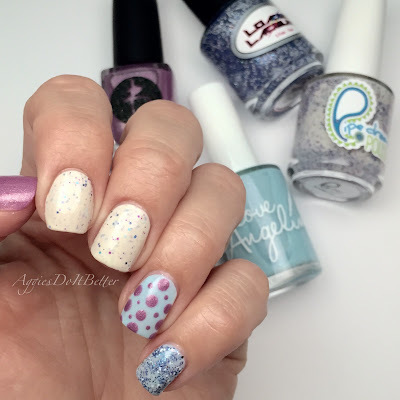 Pipe Dream Polish "Bundled Up"
Love Angeline polish "Let's Snuggle"
Bliss Polish "I Really Can't Stay"
and the "guest" indie maker was Heather of Loaded Lacquer! Her polish is "Wind Chill"
This also marks my first Bliss polish (I got this one before the Starbucks one) and my first Love Angeline! That blue tho! This is the look I came up with using all 4! I just love how well they all coordinate. Heart eyes!